It was just over a year ago that Diamondback left the entire triathlon community collectively mouth ajar with the introduction of the Andean. At the time, there tended to be two very polarizing viewpoints. You either truly loved the groundbreaking design, loads of storage options, and disc only brakes. Or, you despised everything about the bike. There were very few that fell in between. And that’s ok – sometimes it takes a little controversy to push an industry forward. 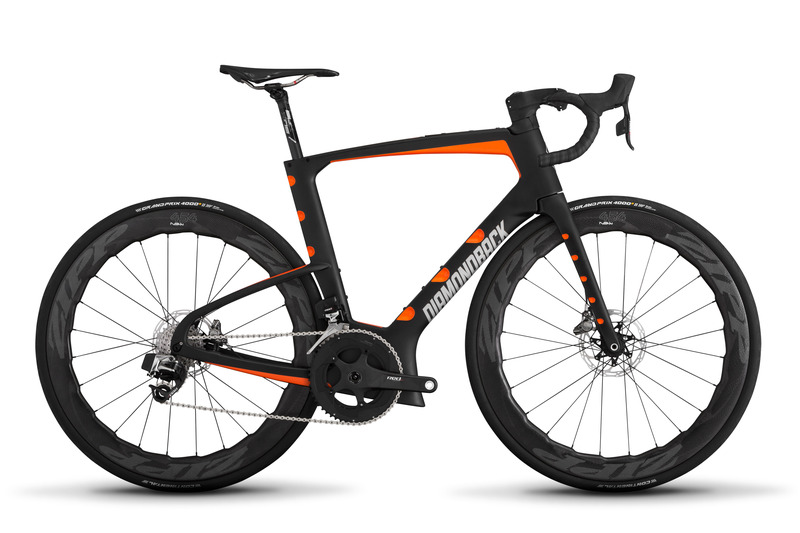 And that’s why today Diamondback is introducing us to the Andean’s road bike sibling – the IO. 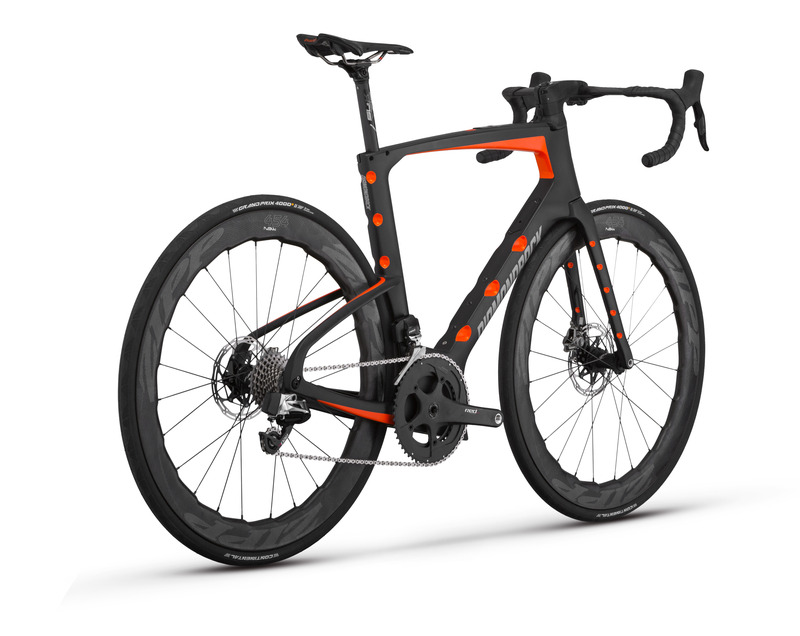 The IO is intended to provide a performance edge to athletes competing in triathlons and self-supported ultra-endurance events where an aero road bike, rather than a pure triathlon bike, is the tool of choice. Where the Andean is all about aero, the IO is built for road riding which tends to involve more climbing than triathlons and time trials. Therefore, weight savings takes a higher priority, with the effort to shave grams often coming at the expense of aerodynamic efficiency. Instead of tubes being designed as complete airfoils, they are often truncated to save weight. But that does not mean aero was sacrificed. From the moment you first look at the IO you can easily see the influence of the Andean. Starting from the bottom up you have the Aero Bottom Bracket Storage. Diamondback worked to find a compromise between the weight of added storage (something that was less of a concern with the Andean) and the aero benefits and convenience factor of integrated storage. The result was a small storage “locker” located just in front of the bottom bracket. Front and back you get disc brakes. After Diamondback decided to go disc only on the Andean, we were definitely not surprised to find them show up on its road bike brother. Moving towards the back are the IO’s ultra-low seat stays. The seat stays’ main role on a frame is to help with lateral stiffness. The lateral stiffness they provide helps to transfer the energy a rider generates with every pedal stroke into making the bike move forward. While stiff seat stays are excellent for energy transfer, they can negatively impact rider comfort by offering little vertical compliance, which leads to a very harsh ride. 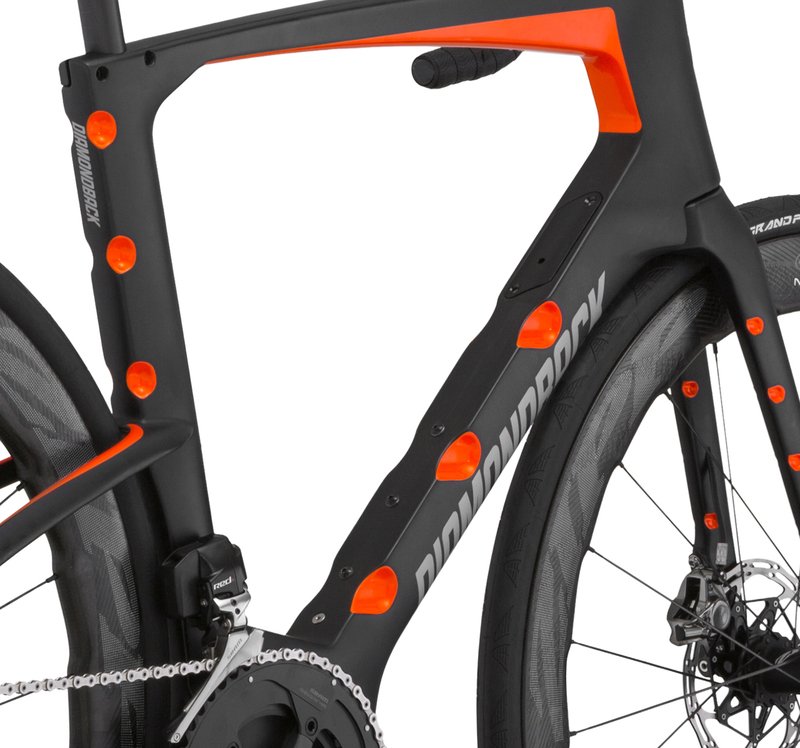 Diamondback designed their new ultra-low seat stays around the right positioning and shape, optimizing for aerodynamic efficiency, lateral stiffness, and vertical compliance. One of the most distinctive elements are the oversized dimples located around the bike. These vortex generators are the focal point of Diamondback’s Wake Control System. The Wake Control System is formed by strategically placing these vortex generators into the trailing edge of the truncated airfoils. These depressions set up mini areas of counter-rotating turbulent flow. When precisely placed in a specific pattern, the counter-flow areas interfere with natural airflow across the frame and significantly reduce the wake that leaves the bike. The IO’s vortex generators better control the wake and significantly improve the aerodynamic performance of the IO. 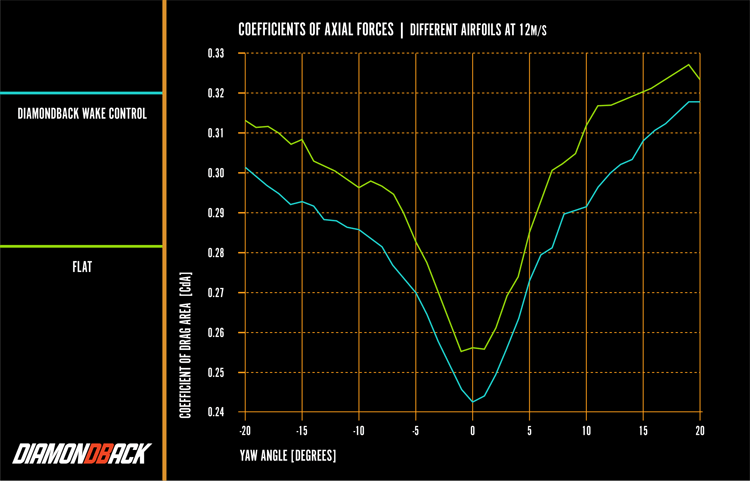 For the cockpit, Diamondback reviewed the leading bars on the market for aerodynamic performance, functionality, comfort, and fit. Based on those criteria, Zipp’s SL-70 Aero handlebar was chosen and used throughout the research and design phases for the IO. 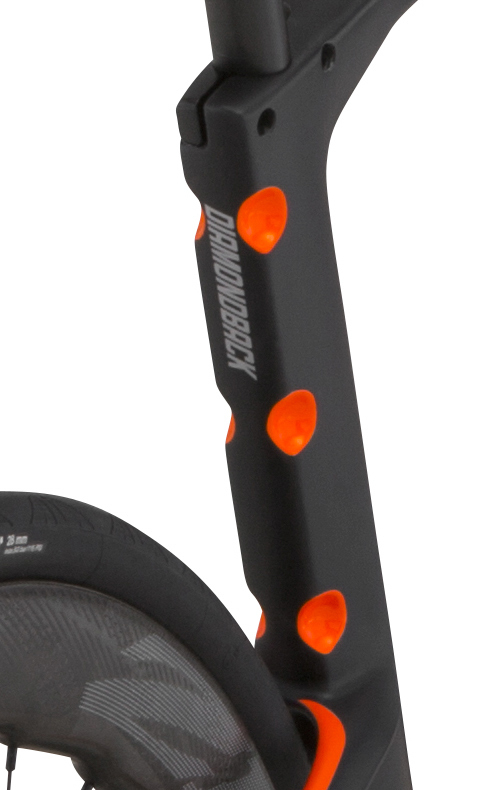 As a result, the IO’s stock handlebar is the SL-70, and the bicycle system performs best aerodynamically with it. 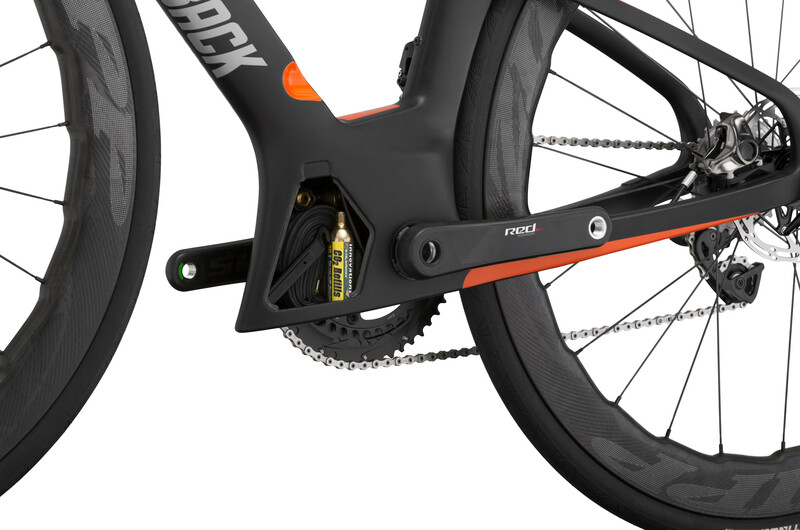 That said, the bar can be removed, allowing the rider to use a bar that may better meet their comfort or position needs without paying a significant aerodynamic penalty. And for those looking for an easy nutrition storage solution, the IO includes a top tube storage compartment just behind the handlebar. This compartment is easy to access throughout the ride and large enough to accommodate a variety of nutrition options. Diamondback shared their testing data from both the University of Toronto and the San Diego low speed tunnel. While the full test criteria were not shared, Diamondback did say that both tests were performed at 30mph. The results are a claimed 20% increase in aerodynamic efficiency than the Podium, and only 10% slower than the Serios. This is a test conducted at the University of Toronto Institute for Aerospace Studies (UTIAS) 0.3m wind tunnel comparing full-scale bicycle downtube cross sections. The “flat” test specimen is a conventional smooth-walled airfoil similar to one used in the Diamondback Podium. The “Diamondback Wake Control” test specimen is an airfoil with inverted ‘vortex generators’ at the trailing edge. The pattern is custom-designed to suppress the trailing turbulent wake commonly found in truncated (kamm-tail) airfoils. The tested velocity is 30mph. The yaw sweep is +/- 20 degrees following a custom Diamondback testing protocol. 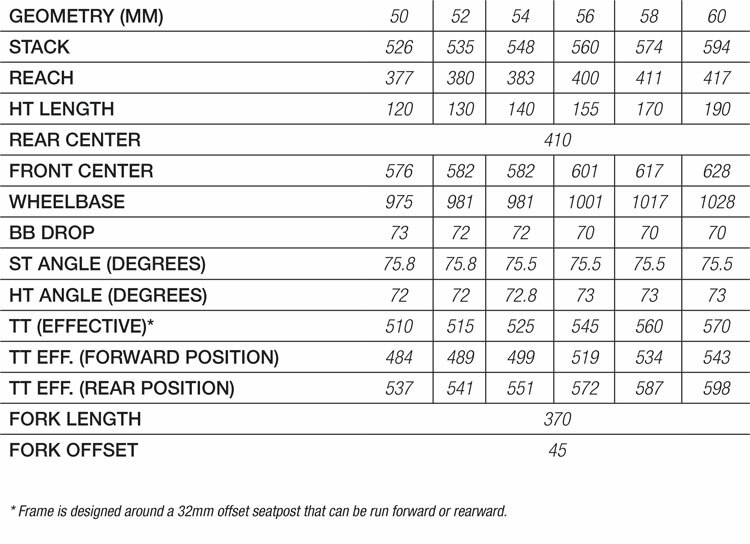 Results are shown in CdA at Standard Temperature and Pressure. This is a tested conducted at the San Diego Low Speed Wind Tunnel (LSWT) comparing full-scale rapid prototype of the Diamondback IO and the Diamondback Podium Disc. The tested velocity is 30mph. The yaw sweep is +/- 20 degrees following a custom Diamondback testing protocol. Results are shown in both grams of drag and CdA at Standard Temperature and Pressure. 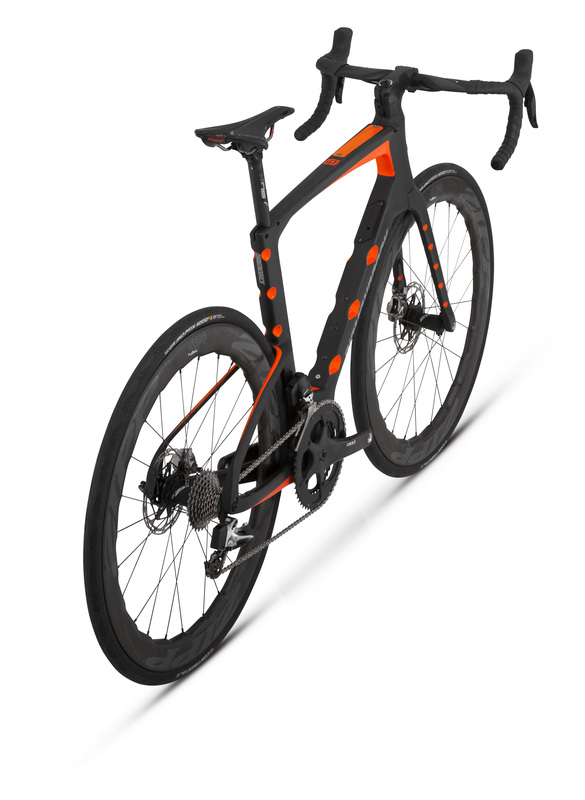 The IO will present an interesting option for those looking to purchase an extremely aero road bike. 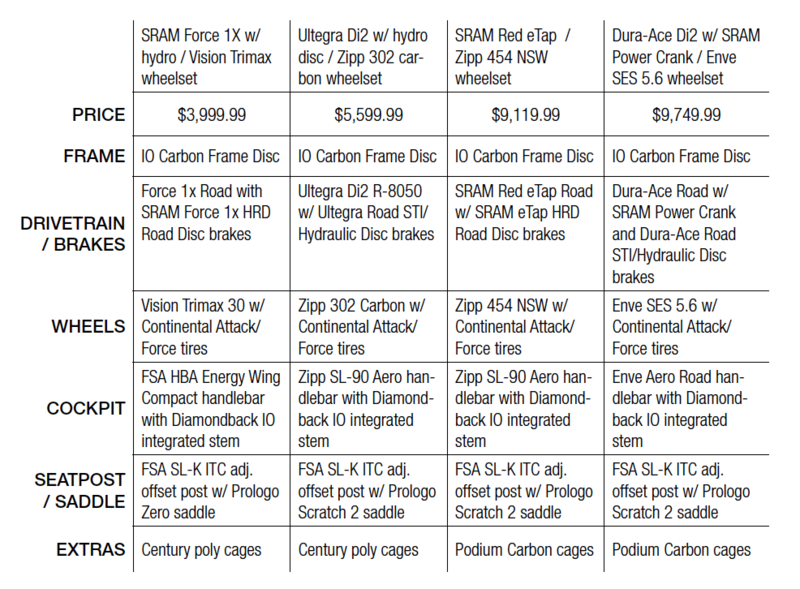 While we do wish they had shared some industry wide comparison data, we do appreciate that Diamondback did dive deep into the criteria they used, and we expect that we will see a proper comparison between the top aero bikes out there in the not-too-distant future. 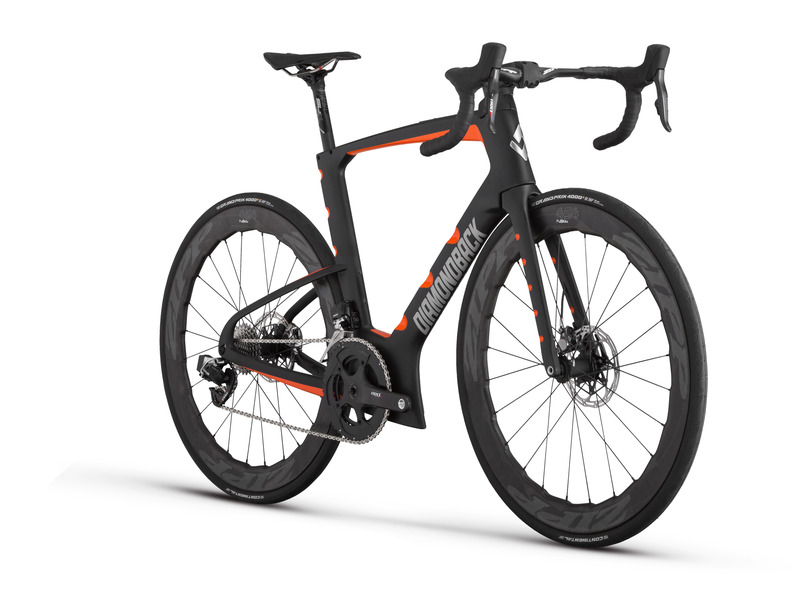 The integrated storage options will definitely be a win for the triathletes and self-supported ultra-endurance athletes, which is exactly who Diamondback built this bike for. And you know we love a good aero road bike. Be sure to stay tuned for a complete review just as soon as Diamondback gets an IO out to us. Has anyone heard an update on this? Lots of buzz last October with the image release. Projected release of “Spring 18″… It’s officially summer and I haven’t heard anything about a release date. Any news?